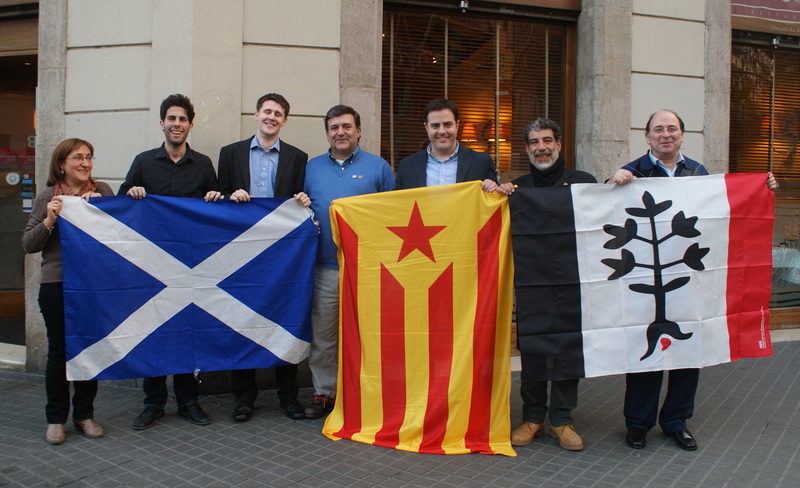 iRS is a Sardinian separatist and socialdemocratic party, founded in 2002, partly as a split from SNI. It currently holds no seat in the regional parliament. iRS became (in)famous in 2005, when it invaded Silvio Berlusconi's Sardinian estate with a large number of party flags [1,2,3]. The party symbol shows a very stylized black eradicated tree accompanied by a black panel at the left and a red one at the the right; plus party name and abbreviation. The flag is somewhat a banner-of-arms, i.e. a vertical triband of black-white-red (4:15:4) with the black tree in the centre [2,3,4,5,6,7,8]. 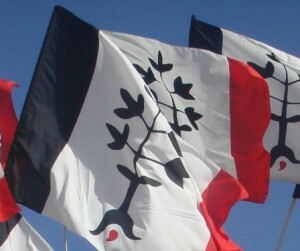 The eradicated tree (in different variations) in recent times has become a prominent symbol of Sardinian separatists; it is a reference to the arms of the Giudicato di Arborea, independent in medieval times. 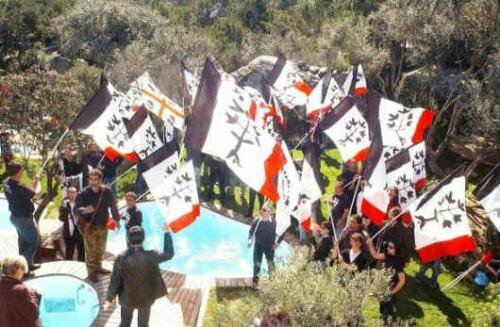 On Page 32 of today's edition (21 March) of The Times newspaper there is a photograph of a large number of Sardinian separatists who had invaded the grounds of Italian President Sergio Berlusconi's villa on the island. They are shown carrying several different flags, some of which I recognize and some I don't. Apparently they were rootling about the villa grounds for some time before the security people noticed them. Photos are at <www.indipendentzia.net> and <www.repubricadesardigna.net>. 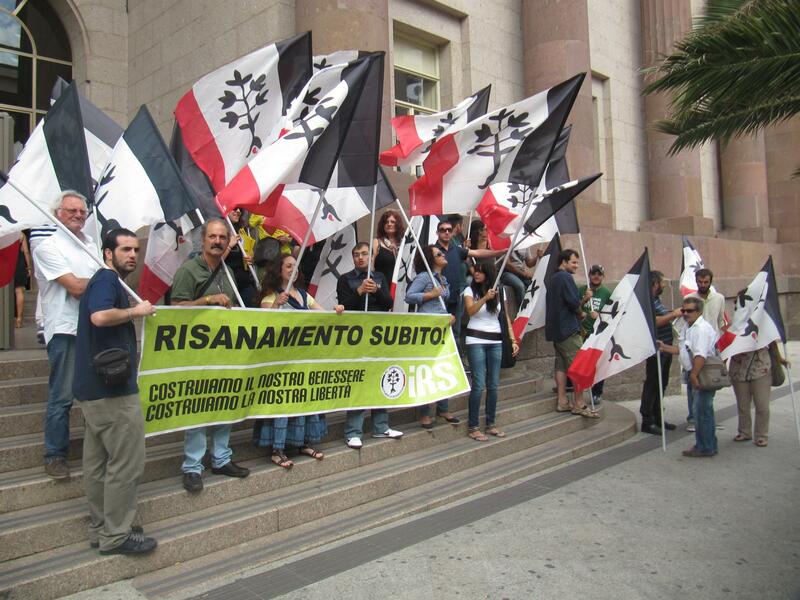 The Sardinian iRS (indipendèntzia Repùbrica de Sardigna = Independence Republic of Sardinia) seems to be a rather new independentist party (founded end of 2003), that widely uses their flags, namely a variant of the Sardinian flag (with inscription "INDIPENDENTZIA"). A large and detailed image is at <www.sucuncordu.net>.